Alisa shares a fabulous pasta puttanesque-a recipe with us tonight…with quite a few variations to fit all kinds of dietary needs! This recipe is Dairy-Free, Nut-Free, Soy-Free, Sugar-Free, Low-Fat, optionally Gluten-Free / Wheat-Free, and optionally Vegan / Vegetarian. Heat the oil in a medium-sized saucepan over medium-heat. Add the garlic, and saute for just a minute or two. Add the tomatoes, basil, oregano, crushed red pepper, onion powder, salt, and pepper (if using). Bring the sauce to a boil, promptly reduce the heat and allow it to simmer for 15 to 20 minutes. While that is simmering, you can prepare any other additions (see notes below). 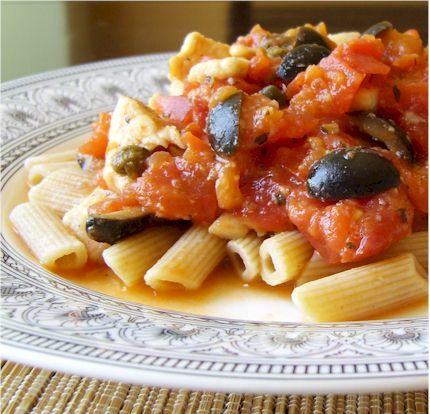 Your sauce should have thickened a bit, so now you can add the olives, capers, and wine, and allow it to keep warm over low heat while you prepare the pasta according to the package directions. Once the pasta is ready, dish up! Chicken: I thinly sliced (1/4-inch thick) 1 lb of boneless skinless chicken breasts. I sprinkled them with 1 tablespoon of cornstarch, 1/2 teaspoon of salt, and 1/4 teaspoon of pepper (I skipped the black pepper in the sauce). I then drizzled a little bit of wine over the top and stirred to coat the chicken with the cornstarch mixture. From there, I heated about 1 tablespoon of oil in a non-stick skillet, and sauteed the chicken until it was cooked through (no pink!) but still tender. I added the chicken to my sauce just before serving. Vegetarian-Style: In my opinion, this sauce is just begging for cauliflower. Cook 12 ounces of florets in the sauce, or lightly steam them, layer them atop your pasta, and pour the sauce on. Alisa blogs at One Frugal Foodie with a focus on using whole foods to create inexpensive, healthy recipes. She is also the founder of Go Dairy Free the website, and author of Go Dairy Free: The Guide and Cookbook. She currently resides in beautiful Lake Tahoe – okay, not actually in the lake, but next to it! This is a standard at our house along with homemade breadsticks. We do add a tablespoon of anchovy paste. One of our family favorites–Iranian Kebob.